Bring comfort and color to your space with this lovely Sun Zero curtain panel. Crafted from polyester in a variety of colors, the solid panel features a room darkening design that blocks light, reduces noise, and helps save energy. The panel features a grommet header for quick and easy hanging. These curtains are really nice and i love the chocolate color. They are a very rich shade and exactly what i was looking for. They are so easy to hang with grommets. 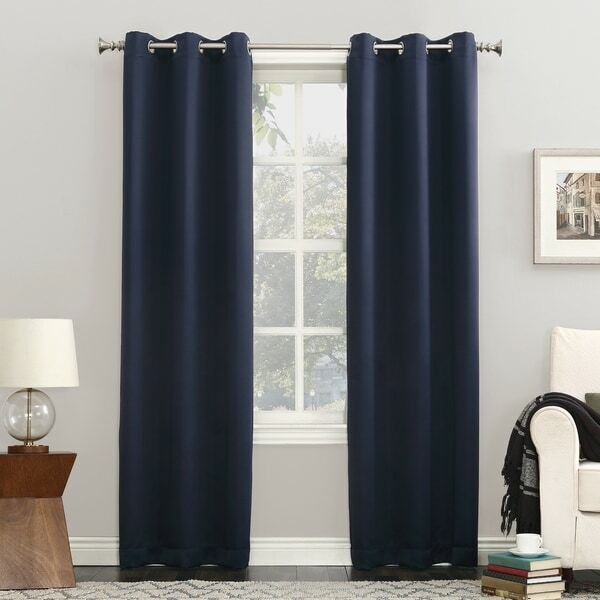 If you need them for a wide window keep in mind that these curtains are only 40 inches wide. Night time in the daytime anyone? These curtains REALLY do block the light. It looks like midnight in my room at noon and I love it! If I worked a night shift and had to sleep during the day, these curtains would be PERFECT for me to sleep well, like it was night. I love the change in my room! Cool, dark, and cozy! I ordered two 84-inch pearl panels for one window. The label on the package suggested that the color is pearl GRAY, and the panels looked that way in the package. Honestly, though, when the panels are up to the window the color is a bit darker than the off white I expected, closer to the stone colored panels shown online or a warm sand color. (My picture, taken in the evening, shows the color relative to an off white ceiling, a bright white curtain rod, and sky blue wall.) The panels seem a little short, but I don't mind the length because there is enough coverage at the top and sides to keep light from showing around the panels. That said, these are not true blackout curtains as others pointed out. Morning light glows through the curtains. The main reason I got the panels was to deal with the intense light from a neighbor's front light at night. The panels do significantly help with that, so I'll keep them for that reason. I love the materials and the curtains are nice; however, they were too short. I ordered 84 inch but I got 63 inches. All in all, they are very nice curtains. The pearl color is more taupe than white. I decided to keep them to use in a different room. They do darken the room a lot though aren’t 100% blackout. 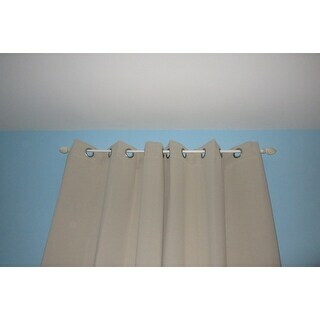 They also do move easily on the curtain rod. Someone said that there was 2 inches of fabric above the grommets but the ones I got it’s an inch, or less. Panels are only 40 inches wide, so bought an extra panel to ensure proper coverage of window. They are on the thin side for a blackout panel, but they block enough light for my needs. The color was rich and the best part....no wrinkles! I would buy these again. 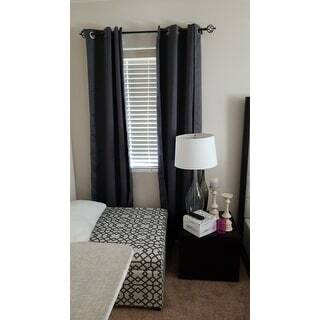 We've had a few challenges with this item, but it was more about Overstock than the curtain itself. They are pretty but they are NOT blackout. They cut light but they don't block light. In our home it takes things from street lights shining in like a spotlight to soft diffuse glow. Good enough to sleep but NOT blackout. Excellent quality blackout drape Panels. (The blackout quality is so good I've overslep many times.) The only reason I could not give them five stars is that the panels are rather narrow. 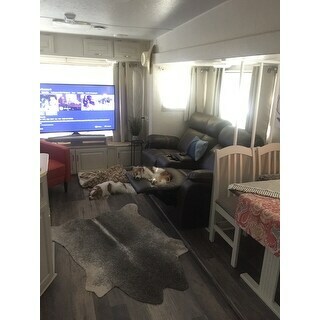 I just ordered a second set of panels to completely cover the windows. Very attractive. The curtain panels are gorgeous, and seem to be well made, but they do still have light bleed through the panel itself. We have 2 windows in our bedroom, and these made a stunning difference in the light level in the room. I love the grommet style hanging, it makes the curtain panels slide very easily when you want light. We did 4 panels per window, and overlapped them where the 2 panels meet- if you were to lay 2 panels on top of one another and hang them full double it would be a true blackout curtain. These curtains are a nice color and look like the picture. My only complaint is they have wrinkles that don't wash or iron out. In my rec room so not so critical as if they were in main area of house. 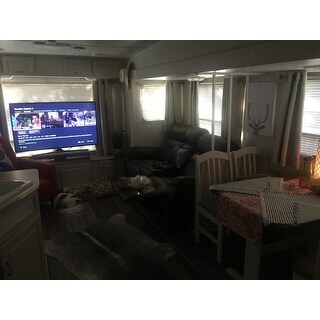 I love these curtains , I cut them off , put an iron in hem and hung them in our fifth wheel ....fabric is very nice and hangs beautifully ...pearl color is perfect . 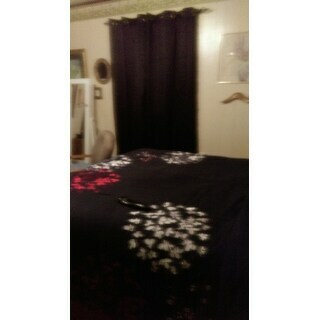 Beautiful fabric .bought this just in time for hot hot summer .definitely black out curtain. We purchased charcoal color .fabric so soft and I iron all panels as it got wrinkle and so worth it . Good light blocking curtains, especially when used with shades or blinds. These curtains work well at blocking most light. I have the lightest color, so that may allow a bit of light through during daylight hours. It’s pitch black in the room at night. I always used to have my bedroom in total blackout. These allow some soft, very diffused light through. I still sleep well and have a small amount of dim light coming in when the sun is fully up. I like them very much! Great sun blockers. Extraordinarily easy to hang. Heavyweight material. Nice style, too. Was way too small for my window, even when buying two, and thus were not fully blackout. Keep plenty of daylight out. I like that they are soft and stay in place when you open them up. I like everything about the curtains! I would definitely recommend them to my friends. They are doing exactly as promised, keeping the sunlight out of my bedroom when I'm trying to take a nap. They are simple and elegant, and I have to order more in different colors! I received the curtains today and they’re already hanging up in my bedroom. I’m extremely pleased with the quality and especially with the price as compared to retail store prices. I put these in my office and they are perfect. Great color, texture, and light control. These are nice quality and are pretty good at shielding light. I would do a double curtain (and curtain rod) if you are looking for a pitch black room. Though these work well and are a good price. This curtain is truly zero sun. My kids sleep better and for longer hours now. Very good product. "Does anyone know what diameter the grommet hole is for hanging the curtain on the curtain rod?" "What kind of backing do these curtains have?" These do not have backing The back is the same color on the front and back. True, which is why they are not blackout curtains! "I want to order 4 of these Sun Zero Hayden Grommet Blackout Single Curtain Panel, but it only let's me select 2. Even when trying to add another color, it only allows 2, and I still can't change the color to get all 4 the same. How can you fix this?" "I am trying to cover a my patio doors + window which measures 113" wide. I will need 3 of these panels, yet it will only let me order one or two. When I add the third panel, it reverts back to a quantity of 2. Please help." "How many do I need to buy for 2 windows?" You would have to buy 4 panels for two windows. "I'd like to get 8 panels but the drop down menu doesn't allow for more than 4 panels to purchase.. Regardless of what color or size I pick. So do I have to make 2 orders for 4 each??" I would suggest adding it to your cart twice ordering 4 panels with each order. "How would you describe the pearl color??"